Columbus native Erin McDougald returns home next weekend for a special concert. From McDougald: “On Saturday, June 30th, at 8pm, The Short North Stage will present Columbus-native, Chicago-based jazz vocalist Erin McDougald at the historic Garden Theater (1187 North High Street) for an unusual and intriguing two-part concert which equally focuses on LA-based, international guitar star, Bruce Forman, who will begin the first half of the evening with a one-man show entitled The Red Guitar. Bruce Forman and Erin McDougald will then do a second set of hard-swinging, modern jazz, together, with Erin’s rhythm section – which includes Columbus-native-turned-New York drummer Cedric Easton.” Tickets are $35 cash at the door or online here. Keep reading for more details on both performers and my thoughts on McDougald’s excellent new Outside the Soiree. Bruce Forman’s one-man jazz libretto is being performed all over the world (including recent performances in New Zealand and Europe); it explores – through music and humorous, narrative story-telling – the pursuit of a life in music and the question of passion versus obsession (it is loosely inspired by such concepts presented by the films The Red Violin and The Red Shoes). Forman, who has toured and recorded with giants such as Dizzy Gillespie, is a self-described cowboy and credited with reinventing Jazz Bebop through his Western-Swing group CowBop and is dually known for his casual, comical style on stage, not to mention his beautiful guitar work in several Clint Eastwood films, including the Oscar-winning Million Dollar Baby. 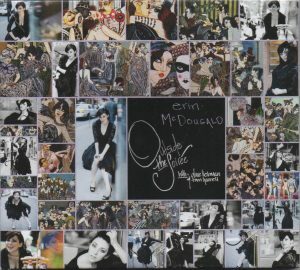 McDougald, nicknamed The Flapper Girl for her modern-meets-vintage aesthetic and feminist socially-conscious writing, is supremely creative in her ability to reinvent yesteryear’s standards into progressive, time-bending jazz statements while leaving room for her heady original compositions or genre-mixing songs –to which she always gives a thorough and evocative jazz treatment. Praised by Downbeat and ICON magazines, among many others, her latest album, Outside the Soiree, has garnered global acclaim and international airplay, staying on the National Jazz Billboard charts for six weeks. She will be treating the audience at The Garden Theater to a few superb songs from her new album with Bruce Forman’s added musical presence to sweeten the deal. Outside the Soiree is an epic display of the talents of an accomplished vocalist backed by expert musicians, rendering standards, originals and unexpected tunes with effortless style. McDougald and her band swing hard out of the gates on “Don’t Be on the Outside,” with the vocalist establishing a classic, smoky cool bolstered by Mark Sherman’s vibraphone shading and high-flying solos from the legendary Dave Liebman on soprano sax and Tom Harrell on trumpet. A deliberate and glamorous reading of “Begin the Beguine” is full of romance, as McDougald and pianist Rob Block unite to shimmering effect. McDougald’s tune “Midnight Sun” gleams with a timeless appeal, and the acrobatic vocal line is beautifully aided by passages from Sherman and Liebman. The title track, another McDougald original, also stands shoulder to shoulder with established material, with passionate lyrics shedding light on a night in Chicago along with spotlight turns from percussionist Chembo Corniel and bassist Cliff Schmitt. McDougald’s energetic take on obscure 1950’s ballad “Don’t Wait Up for Me” is a bold success, with Liebman and Harrell offering their own nimble flourishes and the band swelling in support. A blend of “Linger A While/Avalon” is a sunny, alert sprint that still enables McDougald to put forth her vintage personality along with strong solo work from Rob Block (on guitar) and Harrell. After a subdued yet vibrant spin on Broadway tune “Unusual Way,” McDougald takes one more inventive swing with an arrangement of traditional Irish funeral hymn “The Parting Glass.” Her take maintains the heft of such subject matter while still swinging hard, with passionate parting shots from Liebman, Harrell and the cast a particular delight. Outside the Soiree is highly recommended for fans of classic jazz with modern spirit. Pick up an autographed copy at the concert, and visit her website to learn more.